Click on photo for larger view! 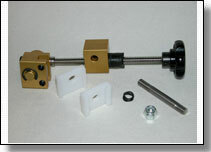 This kit can be ordered with or retrofitted to any gauge. It allows easy and precise movement of the lie bar. You won't have to lock and unlock the lie bar for each position change. Just turn the knob to the desired position and read the pointer.